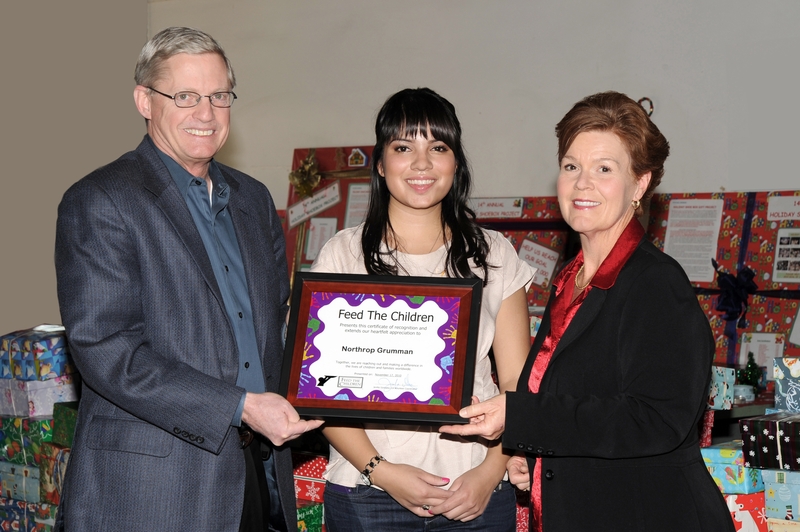 AZUSA, Calif., Nov. 24, 2010 -- Northrop Grumman Corporation's (NYSE:NOC) Azusa campus recently concluded its 14 th Annual Holiday Shoe Box Gift Project drive with more than 2,000 shoe boxes full of gifts collected for the benefit of the Kid's Stuff U.S.A. program sponsored by Feed The Children, an international, non-profit relief organization. The shoe boxes were filled with holiday gift items for children ranging from infants to teenagers. The gift items ranged from dolls and accessories to toy cars, games and books. "Helping those less fortunate individuals in our local communities is one of the cornerstones of Northrop Grumman's corporate citizenship efforts," said Dr. Stephen J. Toner, vice president of Northrop Grumman's Azusa Operations. "Employees here at Azusa and across the company exemplify the true spirit of giving, especially at this time of year, by participating in such worthwhile programs as these. At Azusa, we set a goal of 1,800 shoe box gifts and thanks to the generosity of our employees, that number was far exceeded." Since the inception of the company's Holiday Shoe Box Gift Project in 1997, over 14,800 shoe boxes have been filled with gifts for needy children and distributed by Feed The Children to those in need locally and across the United States.